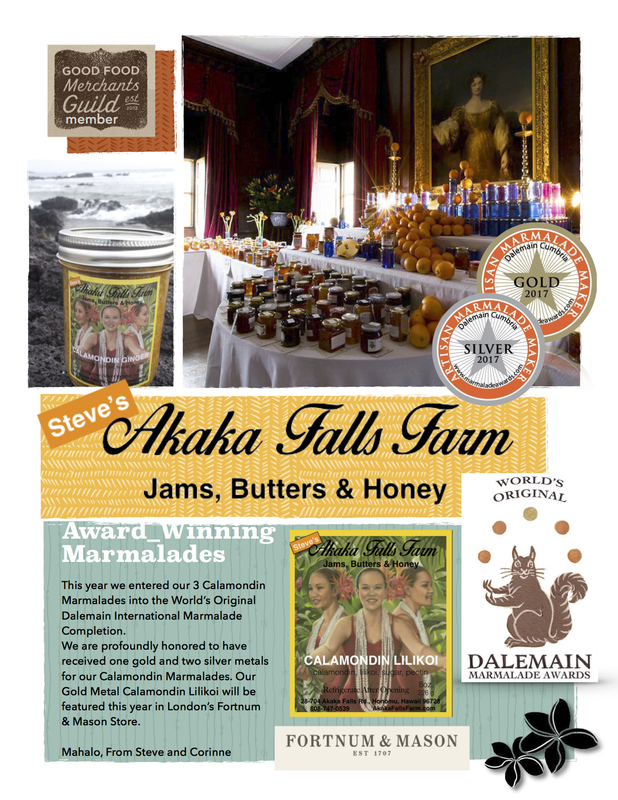 Local preserves company -Steve’s Akaka Falls Farm- is toasting their success having received a prestigious food award at the 12th World’s Original Marmalade Awards celebrations at Dalemain. With record entries from around the globe, this Award proves that their marmalade really is world class. 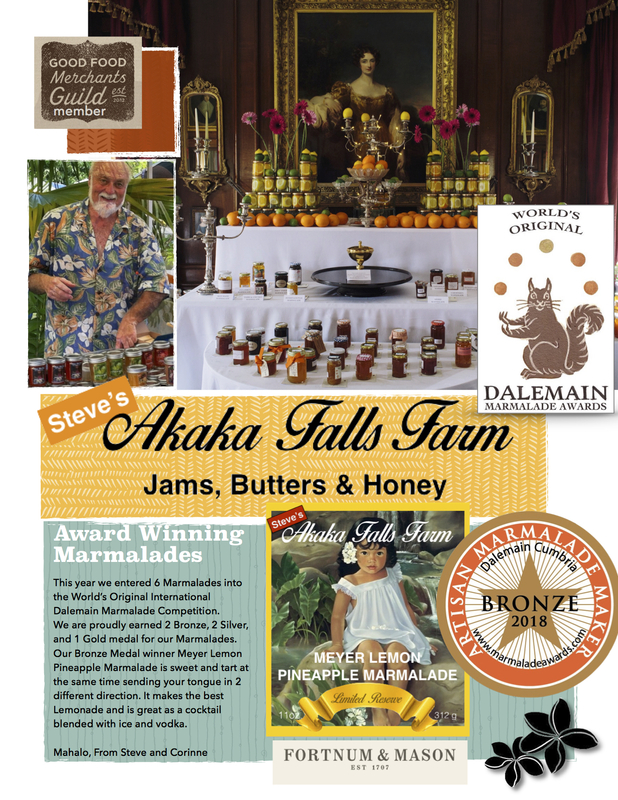 Steve’s Akaka Falls Farm from Honomu on the island of Hawaii, has just scooped a Gold and two Silver awards in the 12th World’s Original Marmalade Awards. 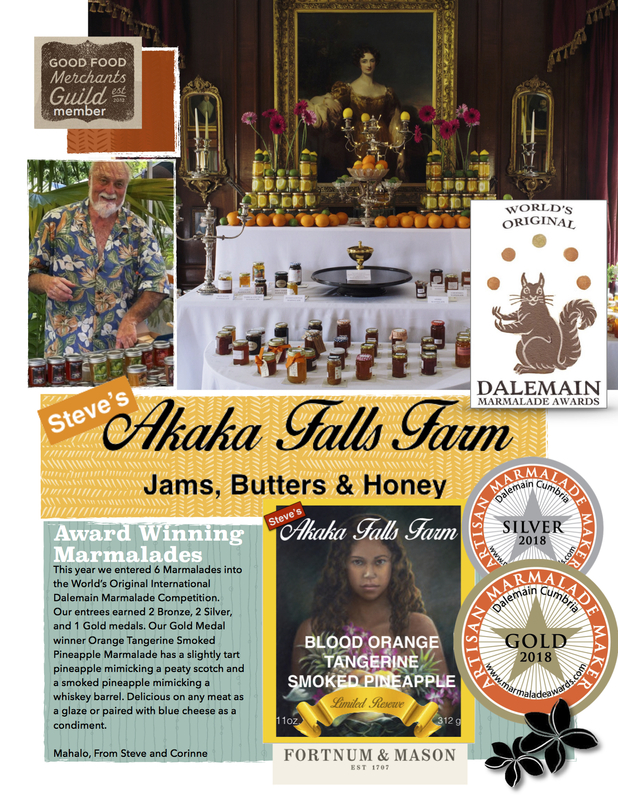 Steve’s Akaka Falls Farm won three of the marmalade world’s most prestigious accolades for its CALAMONDIN MARMALADE, CALAMONDIN GINGER MARMALADE and CALAMONDIN LILIKOI MARMALADE which impressed judges with its appearance, color, consistency, aroma, and flavor. 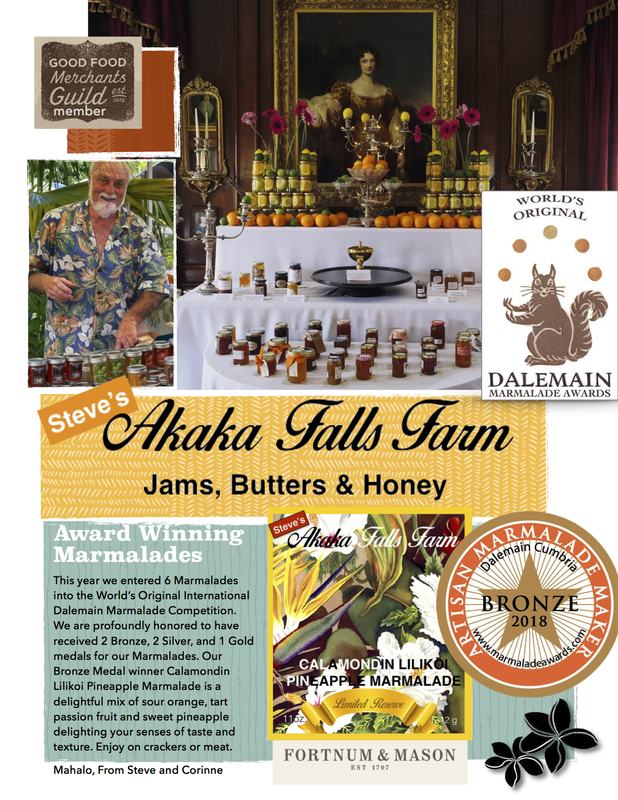 Steve’s Akaka Falls Farm marmalade was one of the six gold winners to have their jams sold at the famous Fortnum & Mason (fortnumandmason.com). Owner Steve Stefanko said they were delighted to win the award: “This is a golden award for us in more ways than one! We are so pleased to have won this award against such strong competition from all over the world. We’ve got our preserve pans at the ready to make lots more jars so please come and try it at AkakaFallsFarm.com. The Artisan judges for 2017 were a prestigious panel of food industry experts, including Sam Rosen-Nash from Fortnum & Mason and Dan Lepard, food writer, and baking guru. The guest of honor at the festival was the Japanese Ambassador, who was delighted to attend and taste the many Japanese entries ahead of plans for a Dalemain sister festival of Marmalade in Japan. The Awards are sponsored by Mackays of Dundee, Tate & Lyle and Fortnum & Mason, and are proud to raise money for palliative care around the world. This year’s key beneficiaries include Hospice at Home Carlisle & North Lakes and Marie Curie Scotland, and to date, the Awards have raised well over £200,000 for charity. We are a small family farm that grows over 50 different types of fruit on the island of Hawaii. We take great pride and care in producing our special island made jams, curds, marmalades, and honeys. Please review our website or visit us at one of the farmer’s markets on the island of Hawaii, and choose a wonderful variety of flavors delivered from our kitchen to yours. The Marmalade Awards: What are they all about? The quirky World’s Original Marmalade Awards were founded in 2005 to help to preserve, grow and widen one of the most British of customs – marmalade making. The Awards have humor and a life of their own and have inspired people from all over the world to get involved. In 2017, almost 3,000 jars of marmalade were sent from countries as far away as South Korea, Greece, USA, Australia and Japan, while the Artisan Marmalade competition has helped to promote small producers around the world. Judged by a small panel of experts, Dalemain roundels denote marmalade of exemplary quality. At the heart of the Awards & Festival is Dalemain Mansion, a Georgian stately home lived in by the same family for over 300 years and the holder of a rich archive of early marmalade recipes. 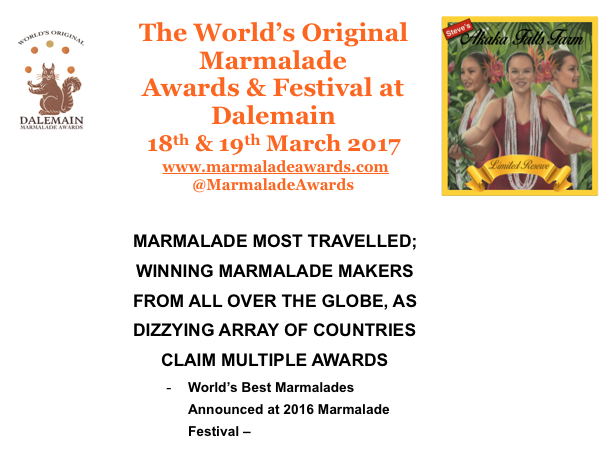 Dalemain Mansion displays all the golden and glorious homemade marmalades entered in the competition, plus all the best artisan marmalades from around the world. A selection of the artisan marmalades is available to taste for FREE and buy.